The annual capacity of the Pellet Plant is to produce about 3.5 Million tons of Iron ore Pellets. Other facilities include Reclaimer to load Pellets directly from Stockyard to vessel. Pellets produced at the Mangalore Plant have excellent metallurgical properties and are an ideal feed for Blast Furnace and DRI Units. 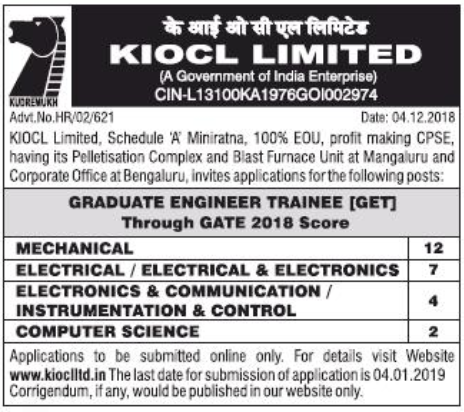 Qualification: Bachelor Degree [full-time] in Mechanical Engineering/ Electrical Engineering/ Electrical & Electronics Engineering/ Electronics & Communication Engineering/ Instrumentation & Control Engineering/ Computer Science Engineering from a recognized University. Note: The candidates should have valid GATE 2018 Score. How to Apply: All interested and eligible candidates can apply for GET vacancies through online latest by 4th January 2019.